To me, the most frustrating thing about being a blogger is trying to get your photos right. The outfits come easy, the photo's of said outfits, not so much. Often I spend so long taking blog photos, only for them to turn out looking like I've taken them on a Nokia 3310, with my eyes shut, and in a cloud of fog. But, regardless to how much the photo's grate on me, I want so much to show you guys my outfits. So, it's a bit of a tricky situation. Still, whilst I am yet to master the art of my Canon, I want to show you this outfit. 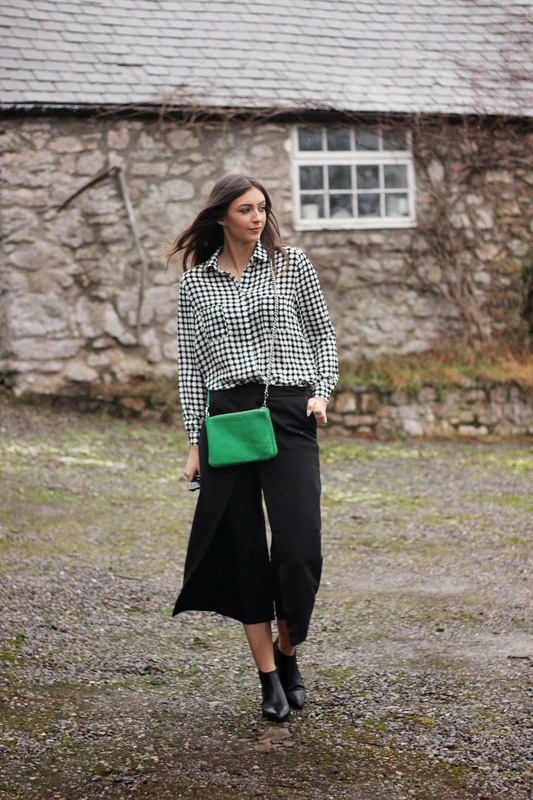 I picked up these Culottes from Lavish Alice last week for £10, and having wanted them for the last few months, I was extremely happy with my bargain. They are such flattering yet different trousers, and I have really been getting sick of tight, skinny, straight leg trousers. This year, it's all about the wide flare. And what's better than a bargain and on trend? Speaking of bargains, I picked up these Topshop chelsea boots at a fraction of the price last week, again another purchase I had been wishfully thinking would come into the sales, and they did. I teamed off an all black look with this lovely monochrome, oversized shirt from Misspap and a dash of green. The added white dots you may see, is the snowstorm that arrived shortly during and after my photo taking session. Whats a girl gotta do to get some decent photos? ?